Kingston is a waterside community, reachable by ferry or car, with a local golf course, hiking, walking and bicycling trails, parks and beach access. Our county is home to several naval bases and home to several aircraft carriers, submarines and support ships. This is a beachside community and the proud home to a first rate golf course, bike, walking and running paths, a fishing pier, exercise facility and tennis courts. We have two casinos nearby for entertainment and fine food. From May to October we have a Farmer's Market at our Marina Park every Saturday. Also on Saturday evenings are "Concertc on the Cove" with live local music and a beer garaden. Other events include a 3 day 4th of July Celebration with the longest running/uninterrupted parade; Kites Over Kingston; a Wine Walk; and Slug Hunt featuring ceramic slugs decorated by local artists and schools students, to be found after purchasing a Slug License. We have a local theater showing first rate films and a theater with highly rated local talent in stage productions. Several local areas provide symphony, choral and barber shop music, plus the Naval Undersea Museum within minutes travel. 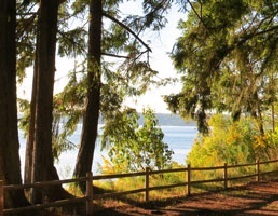 We are a community on Puget Sound in the Pacific Northwest. We are served by a ferry system that connects to train service to Seattle and SeaTac International Airport. Kitsap Transit provides bus service and several taxi services connect us to other communities. Our county has two hospitals and several major medical clinics and we are within travel distance to medical care including a Level I trauma center in Seattle and served by emergency air transport service, plus a VA Hospital. Jan 35.2 F° 40.8 F° 46.4 F° 4.5 "
Feb 36.2 F° 43.0 F° 49.7 F° 3.7 "
Mar 38.1 F° 45.9 F° 53.6 F° 3.8 "
Apr 41.8 F° 50.0 F° 58.3 F° 2.8 "
May 47.3 F° 55.9 F° 64.5 F° 2.1 "
Jun 51.7 F° 60.5 F° 69.4 F° 1.7 "
Jul 55.4 F° 65.2 F° 75.0 F° 1.0 "
Aug 56.5 F° 66.2 F° 75.8 F° 1.0 "
Sep 52.4 F° 61.5 F° 70.5 F° 1.7 "
Oct 46.3 F° 53.3 F° 60.2 F° 3.3 "
Nov 40.2 F° 45.9 F° 51.5 F° 4.9 "
Dec 35.4 F° 40.7 F° 46.0 F° 5.5 "
Our weather is moderate, seldom going below freezing nor above 100. We are surrounded by evergreen trees year long with Spring flowerng trees in abundance along with bulbs, rhododendrons and hydrangeas. Condos Over 50 Communities We have primarily single family housing along with apartment homes. A new facility opened recently of low income senior apartments adjacent to our newest park which will soon include the community center, senior center, library and boys & girls club. There is also a state veterans home within the county. Home care Senior center Visiting nurses Our Senior Center offers free lunches on Tuesdays and Thursdays. Assistance is available for transportation, home health care, hospice, food banks, medical supplies & oxygen, and home safety among many other services provided within the county. Kingston's middle and high schools enlist volunteer tutors. We are an unincorporated area so everything is done by volunteers with committees including Beautification, Events, Chamber of Commerce/Visitors Center, Economic Development Committee, Friends of the Library and Stillwaters Environmental Center.